The aggressive pace of the festival of new works forces you to go onstage before you are ready. Sometimes that's a good thing. "Electricity"—that's the word playwright Maeve Z recently used to describe the vibe of Fertile Ground. The aggressive pace of the festival of new works, she points out, forces you to go onstage before you are ready. There isn't always time to finesse every detail in the lighting design or rehearse to perfection all the emotional beats. Sometimes you simply have to trust that what you are offering will thrill, move or entertain. During the first four days of Fertile Ground, that trust paid off. The plays I've seen so far vary wildly in nature—from the poignance of Matthew Miller's sci-fi love story To the Moon to the glorious lunacy of the CoHo Clown CoHort's Witch Hunt, a screwball riff on The Crucible—but they each reflect the spirit of boldness that is the festival's brand. That spirit is beautifully personified by Maeve Z's Leaving Manzanita, a play that starts out as a mystery and turns into something more. Set in the minuscule Oregon Coast town of the title, the story follows a group of teens (Haley Jones, Tyler Horan and Kieren Gettel-Gilmartin) investigating the disappearance of their friend Lillian (Adora Bott). While we eventually find out what happened to Lillian, the play's resolution is less important than the way it skillfully transforms from a tale of amateur detectives into a tough and tender coming-of-age story. Leaving Manzanita isn't afraid to break your heart, yet it also embraces moments of profound beauty, like a surreal and awe-inspiring union of two young souls that occurs in the final scene. If Leaving Manzanita is sublime, then Spring 4th Productions' Men in Comfortable Pants at the Hi-Falutin' Pomegranate Hotel is sublimely silly. The partly improvised farce stars Tobin Gollihar and Ian Paul Sieren as brothers (and every other character in the play) running a hotel that is rapidly descending into anarchy, thanks partly to the presence of some alligators and the impending arrival of a New York Times travel writer named Lars Gooselbach. My favorite sequence spotlights the unholy torments of poor Gooselbach, who gets locked in the pantry and is later made to sit on a bed made of meat. Post-Men in Comfortable Pants, I was in the mood for something serious, and Theatre Vertigo's production of Sara Jean Accuardi's The Delays fit the bill. But it did more than that. 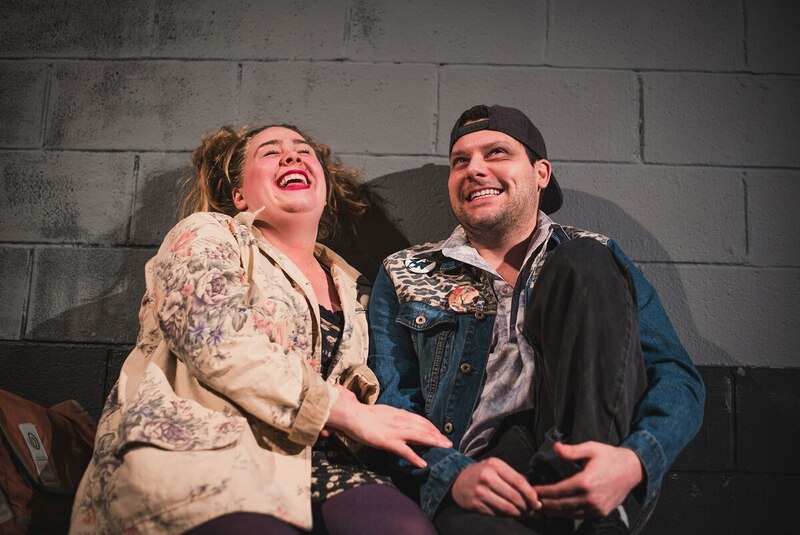 The Delays is not just my favorite Fertile Ground play so far—it will probably turn out to be one of the best Portland productions of the year. Some of the festival's works may require rewrites, but Accuardi's play is both new and a masterpiece, like a child born fully grown. The Delays takes place at an airport Travel Mart on three different New Year's Eves—in 2018, 2008 and 1998. Many of the same characters pass through on those days, and Accuardi ingeniously imagines their lives in the context of political upheavals, including the recent partial government shutdown, the 2008 financial crisis and the impeachment of Bill Clinton. Yet the power of The Delays has more to do with the personal than the political. Accuardi's decision to begin in 2018 and end in 1998 makes watching the play an overwhelming experience. To see a couple on the verge of separating for good in 2018 and then see them awkwardly flirting for the first time 10 years earlier, for instance, is to experience a surge of clashing emotions. How should we feel? Sad that the promise of their affection withered? Happy that they once loved each other? You feel both, of course. That's what makes The Delays so wondrous. It takes regret and satisfaction, pain and joy, and fuses them together to create a tapestry of spectacularly honest stories and characterizations. Leaving Manzanita, Men in Comfortable Pants and The Delays all have upcoming shows. They demand and deserve to be seen—and they're not the only ones. There's always another gem lurking around the corner at Fertile Ground, ready to recapture that familiar electricity and make you say, "Wow, I've never seen that before." SEE IT: Fertile Ground runs through Feb. 3 at multiple venues. Visit fertilegroundpdx.org for a complete schedule.